Alabama’s drop in overall ACT college entrance exam results for the graduating class of 2015 is not surprising, according to ACT, given that the entire graduating class in Alabama now takes the ACT. Results prior to this year only included students taking the ACT on a voluntary basis. Eighty percent of Alabama’s 2014 graduating class took the ACT, compared to nearly 100% of the 2015 graduating class. The ACT Plus Writing was first offered to all of Alabama’s high school juniors in the spring of 2014, and their scores are reflected in the scores released today. 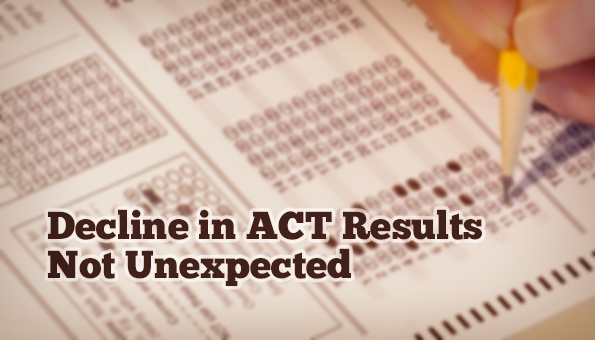 If a student took the ACT again after the 11th grade, only the most recent score is reported was reported in these results. College readiness indicators saw a decline, from 20% of test-takers meeting all four college readiness benchmarks, to 16% of test-takers meeting all four. 28% of students across the country met all four benchmarks. ACT College Readiness Benchmarks specify the minimum scores needed on each ACT subject area test (English, math, reading, and science) that give a student a 50% chance of earning a grade of B or higher in a typical credit-bearing, first-year college course in that subject area. The overall composite score, which is a blend of the four subject areas, dropped from 20.6 to 19.1. The national average composite is 21. The Washington Post reported the composite score drop as the greatest percentage drop across the country, but didn’t mention that Alabama now tests all of its students. They made no reference to college readiness indicators. Writing results are not reported. Alabama is one of 14 states that tests all of its public high school graduates. The other states are Colorado, Illinois, Kentucky, Louisiana, Michigan, Mississippi, Montana, North Carolina, North Dakota, Tennessee, Utah, Hawaii and Wyoming. Ed Colby, spokesperson for ACT, said that other states also saw a significant decline in their average statewide score when they began testing their entire public high school population. Part of the reason for this, Colby suggested, is that prior to having all students take the ACT, only those students who self-selected and were college bound were likely to take the test. Most of those students had been preparing for college throughout their educational journey and had taken higher levels of coursework throughout high school. “This is a new baseline. It really can’t be compared to previous years. You’re not comparing apples to apples,” he said. When asked whether recent changes to higher academic standards could have a positive impact on ACT scores, Colby said the initiatives to raise the bar probably haven’t had a chance to take root yet, but should certainly have an impact down the road. “Our research has told us again and again that you have to start as early as possible in assessing students and making interventions when students are off track to get them back on track (for success),” Colby said. Alabama uses the full suite of ACT testing, beginning with the ACT Aspire for grades three through ten (but not the ninth grade), the ACT Plus Writing for juniors, and the ACT WorkKeys for seniors. Rebecca Mims, Coordinator of Student Assessment at the Alabama State Department of Education, said today that the suite of testing helps teachers and parents understand whether students are ready to move to the next level. Results of the tenth grade ACT Aspire assessment will produce a predicted ACT score. Results of the ACT suite of assessments allow comparisons on a national basis to ensure instruction in Alabama keeps students competitive for college and career opportunities across the country. Mims said there are a number of reasons why the Alabama State Department of Education (ALSDE) made the decision to offer the ACT to all juniors, but the best reason is that the ACT opens up opportunities that they may not have known existed. She shared that a system test coordinator in an Alabama school district told her that his son had always planned to join the army after high school, and taking the ACT is not required to join the military. However, he took the ACT as a junior, and his scores earned him the choice of three service academy appointments he could then choose from. Had he not taken the ACT, those opportunities might not have been available. Mims added that the previous Alabama High School Graduation Exam (AHSGE) wasn’t “transportable”, meaning that students really couldn’t do anything with the results. But now, when they graduate, they have at least one ACT test result available to them to open doors to opportunities after graduation. Q1) Are ACT scores from non-public education compiled/recorded? Q2) Do ACT scores actually affect retention rates for students as Rebecca Mims implies? ACT only publicly reports all scores and doesn’t break them down by public or private schools or homeschoolers. ACT provides the ALSDE with a “public schools only” report. I considered doing an analysis, though it would be without real numbers, of what the overall score was in relation to the public school only score, but there are major problems with that type of analysis. We don’t know who is in private school and who is homeschooling. We don’t know what percentage of those populations is taking the ACT. It is widely accepted that the ACT and the SAT are self-selective, meaning only those intending to go to college are taking it. Many students choose not to attempt the ACT because college isn’t in their plan. The State Board of Education, upon recommendation of Dr. Bice, decided to test all juniors in part because they believed there were students who should be considering college who just didn’t know of the opportunity, thinking they wouldn’t score high enough on the test. Students who choose to attend community colleges aren’t required to take the ACT, but they do take a different entrance exam from the ACT suite: the COMPASS. To answer your second question, only the most recent ACT score is reflected in results released by ACT. For instance, my children took the ACT three times. Only the last score they obtained would have been reported in the public results. So it’s possible that the 11th grade score isn’t reflected for students who took the test multiple times after that initial junior state-provided ACT test. Therefore, retention would have no place within the results. The big selling point on ACT’s suite of tests has been the ability to pinpoint weaknesses in a student’s learning (content-wise, not ability-wise) to allow adjustments in instruction for that child going forward. It is still up to the student’s teachers to make that adjustment. ACT only publicly reports all scores and doesn't break them down by public or private schools or homeschoolers. ACT provides the ALSDE with a "public schools only" report. I considered doing an analysis, though it would be without real numbers, of what the overall score was in relation to the public school only score, but there are major problems with that type of analysis. We don't know who is in private school and who is homeschooling. We don't know what percentage of those populations is taking the ACT. It is widely accepted that the ACT and the SAT are self-selective, meaning only those intending to go to college are taking it. Many students choose not to attempt the ACT because college isn't in their plan. The State Board of Education, upon recommendation of Dr. Bice, decided to test all juniors in part because they believed there were students who should be considering college who just didn't know of the opportunity, thinking they wouldn't score high enough on the test. Students who choose to attend community colleges aren't required to take the ACT, but they do take a different entrance exam from the ACT suite: the COMPASS. So it's possible that the 11th grade score isn't reflected for students who took the test multiple times after that initial junior state-provided ACT test. The big selling point on ACT's suite of tests has been the ability to pinpoint weaknesses in a student's learning (content-wise, not ability-wise) to allow adjustments in instruction for that child going forward. It is still up to the student's teachers to make that adjustment.